A print we found in Paris. We just left Sacred Heart and were walking the narrow streets of Paris at night (yep, you're right... it was awesome) when we passed this tiny little gallery. We found this piece and it was perfect for our living room. 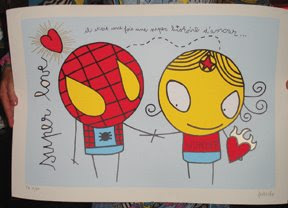 My favorite character is Spidey and Lily's favorite character is Wonder Woman. Great piece!!! I love it. Yeah, we can't wait to hang it!